How can you possibly make your JAGUAR more powerful? Attach an Atari double-speed CD player! 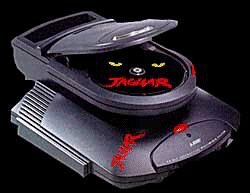 This high-quality CD-ROM unit plugs into any JAGUAR console. CINEPAK technology delivers full-screen, true color, full-motion video and audio. You can even play your audio CD's, and watch as the built-in Virtual Light Machine kicks in to add dazzling on-screen effects to your music!